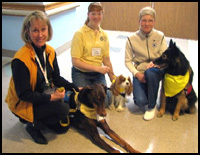 Pet Therapy is a volunteer program where handlers and their certified and registered companions visit patients or residents in care giving facilities. These facilities may include nursing homes, retirement facilities and hospitals. Some communities may have special therapy programs for pet visits in hospice settings or visits with children at schools or camps. Qualified teams may be able to visit patients in a psychiatric hospital or persons doing time in prison. There are non-profit organizations with specific locations for outpatients battling various health related problems that may welcome pet visits. To learn about the benefits for people receiving pet visits please refer to the Overlake Hospital section. Which Species Can Participate in Pet Visits? Many domestic animals make suitable therapy pets. Every therapy organization has its own policy as to which species will be accepted as a therapy pet. 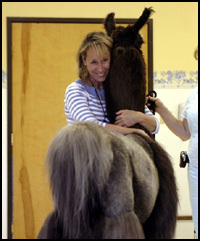 I have evaluated and certified dogs, cats, llamas, birds, guinea pigs, bunnies and a miniature horse. The therapy evaluation is modified to suit size of any pet such as toy breed dogs, and of course the species. Dogs are the most common species for pet visits and all purebred dogs and mixed breeds are more than welcome to become involved with pet therapy. What Is Expected of a Therapy Dog? Dogs must like people and not be intimidated by strangers wanting to pet, cuddle, and if a toy breed, hold the pet. Some breeds and some dog personalities are more aloof than others and it is important that the person who is receiving a visit feels accepted. The dog needs to be calm, friendly, well mannered and under control by the handler. It is important that the pet be comfortable around unusual noises, unusual movement, different smells and sights. The dog needs to be comfortable around medical equipment such as a walker, cane or wheelchair. Dogs that visit patients in hospitals will be around medical equipment that may emit unusual sounds. Some environments are very busy and some more sedate. A positive visit is where the dog is appropriately matched with the population and the environment. Some dogs are more suited to visit the elderly, some more suited to visits with children and some dogs offer their special gifts to anyone wishing a visit. The team evaluation process tests both the handler and pet in various simulated circumstances such as those situations a team may encounter on a pet visit. These tests or exercises give the licensed evaluator the opportunity to test the pet's temperament and behavior in a variety of mock situations. The tests also evaluate a handler's ability to control that pet in these mock exercises. A handler should be comfortable talking with strangers in care giving facilities and be the pet's advocate to ensure both their companion and the recipient of a pet visit stay safe and enjoy the interaction. The tests are modeled after the American Kennel Club's&REG; Canine Good Citizen test. The therapy organizations have modified the tests for their specific protocol and insurance coverage. Some organizations will register species other than dogs. The following information includes various options to suit your needs. Our seminars and pet therapy prep class can help prepare your team to test for most of the therapy organizations you choose to join. 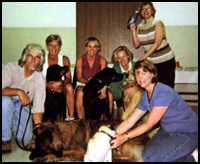 The schedule for the seminars, training class and evaluations, along with information covering class content, location and fee structure is included in the Therapy Pets section. Classes and seminars are offered year around. If you are not sure if your pet's temperament and behavior are suitable for pet therapy visits we are happy to set up a private, 1:1 session to assess your team and work with you and your pet to achieve your goal. You will be given an overview and suggestions as to what your next step might be. Your next step could be attending the prep class which offers more training in a group setting, or if you are ready to test you could register for your team evaluation. If your team needs fine tuning and you require additional 1:1 assistance, private training specific to your pet therapy needs and goals can be arranged. This popular class is a fun 3 hour training class for any friendly dog 6 months or older that has previously and successfully completed some basic on leash obedience training. This class begins with a quick overview of pet therapy service and information on the evaluation process and certification. Your team will have the opportunity to perform a test run of most of the required test exercises and receive training assistance to help improve handling skills and the dog's behavior to increase your chances of passing the evaluation. Please refer to the Prep Class Overview page page for more information and requirements specific to this class. All species are welcome. This unique, entertaining and comprehensive 1 hour seminar includes everything you wanted to know about therapy service including how to get started, overview of the national therapy organizations, the evaluation process, the reality of pet visits, what to expect and what will be expected of you on your visits and therapy service options. We will also offer evaluation opportunities periodically on site. Read more about pet therapy on our Pet Therapy 101 page. Please refer to the Team Evaluations section in the pull down menu for test dates. This highly successful pet therapy program has been ongoing since 2005 offering patient and guest visits from a wide variety of loving, registered therapy dogs. We are always looking for more wonderful therapy teams to put smiles on the faces of patients at the hospital. Should you be interested in sharing your dog's special gifts with patients at Overlake, please review the information on this site and contact me with any questions. I am proud to be the program coordinator for the Therapy Pets at Overlake Hospital. Teams from any therapy organization are welcome to apply. We are also looking for teams to visit with children at this special year round school. Handlers need to be comfortable around children with special emotional challenges and needs. Dogs must be reliable around small groups of children in a classroom setting, ages 8-18. Visits will also include 1:1 time with students. The therapy teams may be involved with a variety of pet therapy activities with the kids. Along with meet and greets with the kids and dogs, I will be implementing a reading program (children reading to dogs), along with other unique pet therapy programs to help facilitate a fun, successful, non judgmental educational process at this school. Teams from any therapy organization are welcome to apply. You are not required to be a member of any local reading program for our reading activities. I am the coordinator and trainer for this program and would be happy to answer any questions. I had the privilege of being asked to create and coordinate a unique pet therapy program for Camp Korey. Camp Korey is a summer camp for children ages 7-17 suffering from a variety of medical challenges and is an affiliate of Paul Newman's Hole in the Wall camps located around the United States. Due to the overwhelming success of our pilot program in the summer of 2009, we will be expanding the pet therapy program to be a year round program for the kids. Our dedicated teams include a variety of dogs, two llamas and one miniature horse. Registered therapy teams in good standing with any therapy organization are welcome to apply. Feel free to contact me askdiane@aol.com to learn more about these programs.